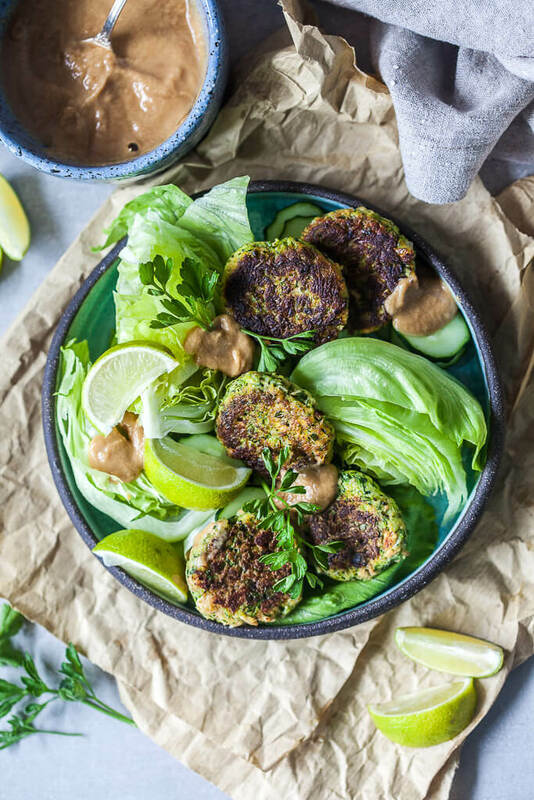 These Tofu Zucchini Fritters are dairy-free & delicious, just perfect with lettuce and a creamy Peanut Sauce. Easy and healthy, with tofu instead of cheese! Wash and dry vegetables. Grate zucchini and season with salt. Massage the salt into the grated zucchini and let it rest for about half an hour. During this time the zucchini will let out water. After half an hour, take the grated zucchini and squeeze out as much excess water as you can. Try placing grated zucchini in a clean kitchen cloth to help you squeeze. Once the water is removed, place zucchini in a bowl. It should have reduced in size considerably. Add chopped spring onion and parsley, minced garlic, crumble in some tofu, add a beaten egg and some breadcrumbs. Stir well until the mixture is thoroughly combined. Take a small amount of zucchini dough, about a table spoon, and roll it between your hands into the shape of a ball, then, squeeze down to get the form of a patty. Repeat until you've used all the mixture. Heat a pan on medium and add about a table spoon of olive oil. When hot, add in zucchini patties and cook for about 4 minutes on medium, or until the patties turn golden brown. Flip each patty over and bake another 2-3 minutes on the other side. Once done, remove from pan and set aside. Repeat until you've used up all the patties. Meanwhile prepare peanut sauce: in a food processor add peanut butter, water, soy sauce, peanut oil, agave syrup, juice of a lemon and 1 clove garlic, minced. Process until smooth. If the sauce is too thick, add more water as to your liking. Transfer sauce to a container. Cut iceberg lettuce into wedges and place on plate. Add sliced cucumber and top with zucchini fritters and some peanut sauce. Decorate with lime wedges and serve.